We normally ride 2 – 2.5 hours after breakfast. Then we stop for a leisurely lunch with warm food. Afterwards, we again ride between 2 to 3 hours before we arrive at our campsite for the evening. Here we will indulge in our delicious evening meal. 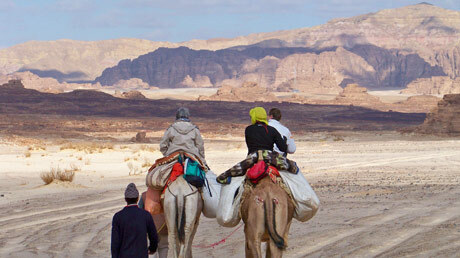 All of us meet in Dahab and travel by car to a beduin village, where the camels are ready and waiting for us. Here the camels will be saddled and packed. We start out in Wadi (dried up riverbed) El Gebi. After around two hours on camel back, we will be reaching El Hedude, a phantastic sand dune, the likes of which are hard to find in the desert mountains of Sinai. A relaxing midday break follows, before we continue onwards to our sleeping grounds under the grand starry canopy in El Mararum. After a refreshing night in the morning we will start out from El Mararum and make our way towards Bir Safra (“Bir” means “well of water”). The area around Bir Safra presents itself as a generously open landscape which is crossed by two wadis, Wadi Sa´al and Wadi Safra. 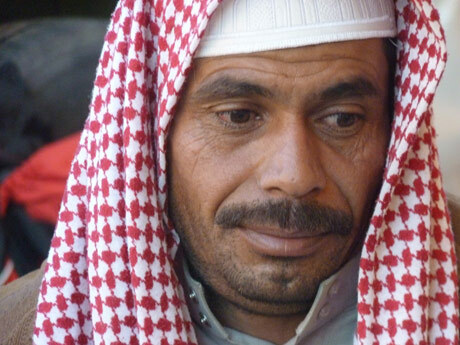 At the place of the well the Bedouins will whip up a delicious meal over the open fire for us. There we will also have the opportunity to have a quick wash at the well in the midday sun. Through an ever changing diversity of sights and scenery we will then travel towards Am Matami. In the Winter months the visibility of the Milky Way in the impressive star filled sky is very good. Whoever has decided that they are too tired, will now have the opportunity to take a refreshingly cold shower in the warm morning sun. Afterwards we will have a relaxed start from Ain Khudia towards the closed canyon. If you desire to do so, we may explore this canyon together. Afterwards we will continue across a mountain through a neighbouring valley to Disgo. Afterwards we continue through a neighboring valley to Disgo. 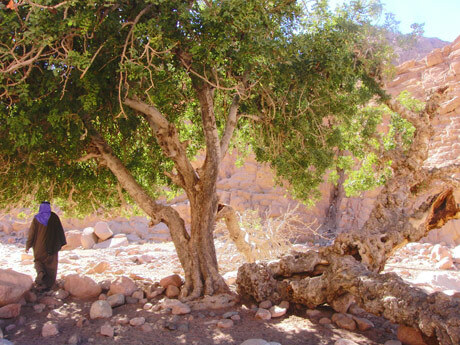 In Wadi Disgo we will spend our well earned midday break under an acacia tree. 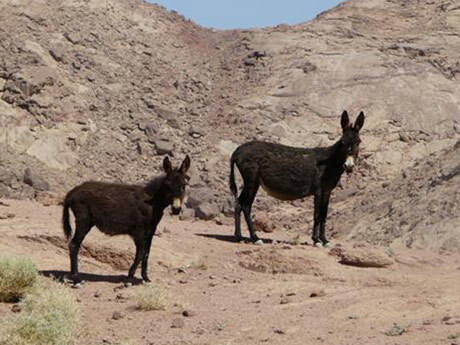 Our route will now take us trough many places where the Bedouins still live in the desert very much like they have done for hundreds of years. We will set up camp in Wadi Disgo for the night. Our route will take us trough many places where the Bedouins still live in the desert very much like they have done for hundreds of years. We will set up camp in Wadi Disgo for the night. In the morning of the fifth day we will hike on foot and will be visiting a small deserted oasis, a truly beautiful place, where we will again have the opportunity to wash off the dust from travelling. 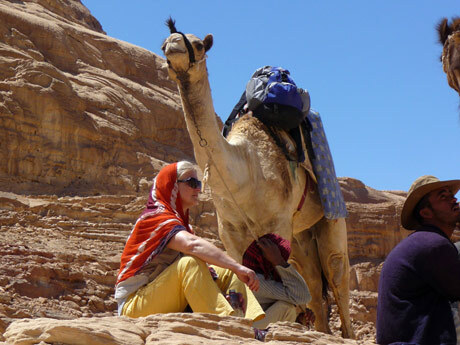 We will walk back to our camp and from there take off by camel in a different direction. Slowly now we will be leaving the splendidly lovely landscape, characterized by sandstone rock formations created by centuries of erosion. Our resting place for lunch will be Atebe, which already displays a bit of a rougher character yet is just as interesting. Onwards we travel through Wadi Samri, where near the Bedouin settlement of Samri we will set up camp for the night. 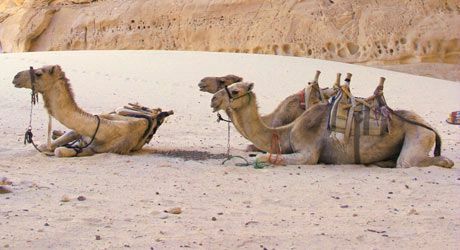 This morning we will let the camels carry us with their long swaying steps through Wadi Megrah and around noon it will be time to visit with friends in the Bedouin settlement of Megrah.. This will give us a small glimpse into the simple life style the Bedouins still lead despite of owning houses and having given up their nomadic life. They quite naturally extend their hospitality to us and will be greeting us with a heartfelt warmth and a glass of tea. Very interesting is also the behaviour of the children, who are quite curious but seldom intrusive or pushy. Later on in the day we will continue on towards Wadi Sitt. Our camp for the night will be set up in Wadi Merreisen. During the previous Easter tour in 2011 this was the place where we did slaughter a goat for our Easter Sunday banquet. 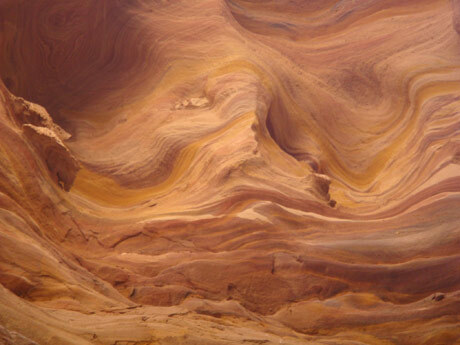 Leaving Wadi Merreisen we will reach a Ravine composed of quartzite and granite stones. This Ravine will lead us to Wadi Rassasa, where we will find a place called Abu Nugrah. This Ravine will lead us to Wadi Rassasa. 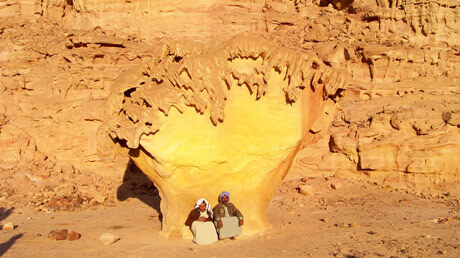 Abu Nugrah is a place where the Bedouin women arrive every spring and settle down for about two months to let their goats graze. Despite the place being seemingly so barren, it is really quite amazing to watch how much green the goats actually do find. 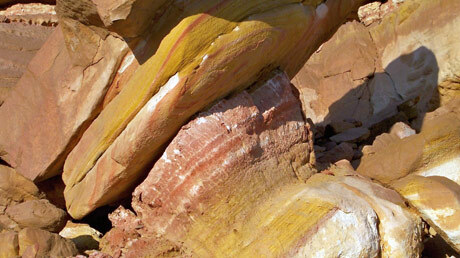 Following our lunch we will be crossing a Canyon lined with beautiful white, ocher, red and purple sandstone. We will then arrive in Bir Zureir, a Bedouin settlement, where we will have tea and will then say goodbye to our guides, cooks and the camels. With a taxi we shall then return to Dahab and will be back in our hotel by evening.